Today we pay tribute to Lakshmi Bai – the Rani (queen) of Jhansi – killed in battle on this day in 1858 by British Imperialists during India’s First War of Independence. She was twenty-two years old. The story of this freedom-fighting warrior heroine is the stuff of legend. Like Boudicca, she trained and personally led an army against occupying forces. Like Joan of Arc, she rode into battle dressed as a man. And, like the fictitious Scarlet Pimpernel, so mysterious and mythologised is the Rani that it’s difficult to identify the truth. Was she beautiful, as most accounts claim? Or was her face disfigured by smallpox? Was she a diplomatic head of state, or a ruthless and cunning rebel? Even the details of her death are uncertain. Many Western sources cite the date as 17th June 1858, while orthodox Indian references state the 18th. According to some versions, she died riding into battle against the British. Others say that she was shot while holding the ramparts of Gwalior Fort. Whatever the truth, the story of a female leader battling for her kingdom against the might of the British fired the Indian nationalistic imagination. During the long struggle for freedom, it was the Rani of Jhansi who served as the emblematic symbol of resistance. So how did this real-life Xena manage to lead an army in the modern era, in direct opposition to the perceived notions of nineteenth-century Indian (and worldwide) feminine decorum? In 1848, the power-hungry British East India Company under the leadership of Lord Dalhousie adopted the “doctrine of lapse” – allowing the British to annex an Indian state if the ruler did not have a male heir. Resistance to the policy, and the subsequent Great Rebellion of 1857, brought the Rani of Jhansi – the young widow of the last ruler of the state of Jhansi – into the political spotlight. After Jhansi “lapsed” to the British in 1854, the Rani repeatedly petitioned the British for her adopted son’s rightful inheritance. To Dalhousie she wrote: “It is notorious, my Lord, that the more powerful a state … the less disposed it is to acknowledge an error or an act of arbitrary character.” She later appealed to the Court of Directors of London, writing that the lapse represented a “gross violation and negation of the Treaties of the Government of India.” Her diplomatic pleas were rejected. When British army Sepoys (Indian-born soldiers) rebelled in Jhansi, the Rani was held accountable despite her lack of involvement in the mutiny. In retaliation, the British army led by Major-General Sir Hugh Rose attacked Jhansi in March 1858, and laid siege upon the fort. Lakshmi Bai escaped and was tracked to Banda, where Rose’s forces reported that “… though the fellows did their utmost, she got away … She is a wonderful woman, very brave and determined. It is fortunate for us that the [Jhansi] men are not all like her.” In June 1858, 20,000 Indian rebels led by the Rani – donned in full warrior’s regalia – mounted an attack on Rose’s forces outside Gwalior. And it was here that the queen met her death. Rose wrote of his foe: “The Rani was remarkable for her bravery, cleverness and perseverance; her generosity to her Subordinates was unbounded. These qualities, combined with her rank, rendered her the most dangerous of all the rebel leaders.” The British captured Gwalior three days later, and burnt the royal library containing thousands of ancient Sanskrit scriptures. In 1942, an all-women regiment of the Indian National Army formed to fight British colonial rule, was named in honour of the Rani of Jhansi. She was a most potent symbol of women’s empowerment, courage, tenacity and capacity for India – and for us all! l like jhansi rani . she is the heroine of every girl’s mind. RANI LAXMI BAI WAS AN ENIGMA OF INDIA. I LIKE HER VERY MUCH. jhansi ki rani AMAR rahe…!! No words to describe the bravery of Rani jhansi! My salute to late Maharani Laxmibai. Why just to white women, I think to men as well, but fault is ours, as some of our forefathers were driven by greed, and sold there souls and there kind to the white. my only wish is to spread the bravery and sacrifice of maharani for india and i have to stay in jhansi atleast for a week…………..
and i am thinking her as my god and a devotee …..
jhansi ki rani sooooooooooooooooooooooooooooooooooooo grate and brave i like it i am thankful to her. Maharani Laxmi Bai is the incarnation of Maa Durga. not one time but 100 times. then only you can be a true Indian. It is my prayer that the aathma of Maharani take birth once again in India. she did as Indira Gandhi. same date of birth and life history and resemblance. she motivates me as I am in a marriage surrounded by people well versed with English and indian literature aim to own a superior status based on their caste, he is Brahmin and I am shatriya, my husbands parents and like Jhansi husband my husband is also weak and just want to go by being very proper. Seven yrs ago, I challenged his parents as god showed me how his dad asked their son to brainwash kids, boys, against their mother and pull them on his side. My husband was secretly doing this even before. After quietly and respectfully managing my life and their ways, I was furious to see how ur own spouse and his parents can take liberty to own and interfere in a family and marriage of 18yrs. With not much to fall back in foreign land, my inspiration came from Krishna and brave Jhansi ki rani. I hope to motivate other beings, man or woman, who hv been unjustfully exploited. Jhansi ki rani is my role model. And every girl should be like her brave & powerful…………. She was married to Gagadhar Rao. When the righteousness means rebelling alone against one of the greatest power of world, still she felt the responsibility of showing others the path towards freedom with bravery and graceful martyrdom. A women in her twenties only, widow, with child, had infact started the freedom train of india. She proved that there has to be fire in someone to fight for the cause. Being a lady challenging the mightiest empire ever on earth, fighting courageously without any slightest fear, thereby igniting the valoursness of indian manhood. There are very few examples of such brave ladies in history. Though death is ultimate destination of every body, but yet act of 23 old lady is going to be admired for ever. She took a stand when everybody was frightened and confused. She shown the true meaning of bravery, setting herself as example. I totally agree with you and love to watch the episodes of Maharani Laxmi Bai. Her character is an example for the mankind. She was a true leader and a pillar of strength and bravery. I salute her courage and personality. Today we need her, I wish her to come in this world again and replay her story. i really lyk her a lot . i hope women learn to b brave lyk her n try to get sum justice fr thmselves .. wish she would have been thr in our tym !! I proud to be an Indian and I proud to be a part of Jhansi..
My Dream is to See Rani Laxmi Bhai,I she would born again then the Crime of in India will Definetly Lost. my heart is jhansi rani……. she was the real heroine of world. I wish I was born in the era of jhansi Rani and chopped the heads of British. Iam really proud of jhansi. I hade just read this article . I like it but I am eager to know that what happened to his son and her kingdom jansi after her death. I have to make a project on her in skul nd jst by getting alot information of her i wud jst sy dat she iz jst fab, hatts off to her!!!! To share with are children and youth every where, we just launched an ipad/iphone App named Tales of India – Rani Jhansi The Warrior Queen. Pleasse check out our website and help us reach more people. am really happy and i follow for RANI LAKSHMI BAI!!!!!!!!!!!!! ئه‌گه‌ر کوردستان وریا نه‌بێت به‌م زوانه‌ بیانیه‌کان وه‌ک جانسی لێده‌که‌ن. Wake up Kurdish politicians! tribute to her.har har mahadev .i salute her . She was married at the age of 15 and she died at the age of 23. I have heard so many stories before but it is not very excitement as jhansi ki rani laxmibai, she is very brave women in the world, and the proud of indian history but indian people have to be like her, protect their country from enemies and you have to make another history like laxmibai, i wish she is still alive because i want to see her. and i really like to visit indian historical places like jhansi, it is very amazing place so, i will visit someday. india has so many stories that doesn’t told, anyway i want to say laxmibai is a very brave, fearless, strong, prideful women as i have heard. but i have a question, IS THE STORY OF JHANSI KI RANI LAXMIBAI REAL STORY IN INDIA?… THANYOU. Its amazing to that such a woman existed on the earth. Wooooow ! When you imagine all the atrocities of the British and Muslims in India, you hate them. I was so glad I stumbled onto this site. Queen Rani’s bravery is inspiring! I want read more about her! existing! what abrave queen l wish I was there. Is there any connection of Jhansi ki Rani’s Death and Sai (shiridi wale). I do not believe in Saiyyad Mohd Chand Miyan (Sai Baba) so i am just going into depth of all roumers and chamatkars of baba. i respect her for her fight against britishers……….. I want be a jhansi rani and make her name much proud.She did not die she is still standing as indian flag in my heart.She is the only one rolemodel for me. Her dead was a brave death . I mean veera maranam. She is like rolemodel for brave ladies. I really really miss my Kaliyug’s Goddess Ranchandika JHANSI KI RANI LAXMI BAI…. I salute Rani Lakshmi Bai ! I also want to be like her !!!!!!!!!!! 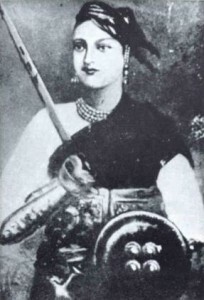 Jhansi ki Rani Laxmi Bai ….. I salute you Laxmibai , you are really great! It is learn that jhansi ki rani arrested and send to england secretly by ship the kill was jhalkai bai. lthough am a Ghanaian girl i really want to be like Rani Lakshmibai. Wow! I wish she was still alive, I would have come from Ghana to salute her..such a great queen has left a great legacy for all freedom fighters across the globe. The entire world will continue to keep her memories!